After an unnecessarily long, extended time in App Review, I’m so happy to be able to tell you that Yoink for iPad and iPhone with iOS 11 is now finally available on the App Store. What’s Yoink for iPad and iPhone? How can I add stuff to Yoink? Obviously, especially on iPad, Yoink was designed for drag’n’drop use, and using it as a Slide-Over or Side-by-Side app, I’d say that’s the best way to use it. Just slide Yoink over any app you’re in and drag to it anything you need later. Then slide it back out, if it’s in your way. There are, however, other ways to add items to Yoink. 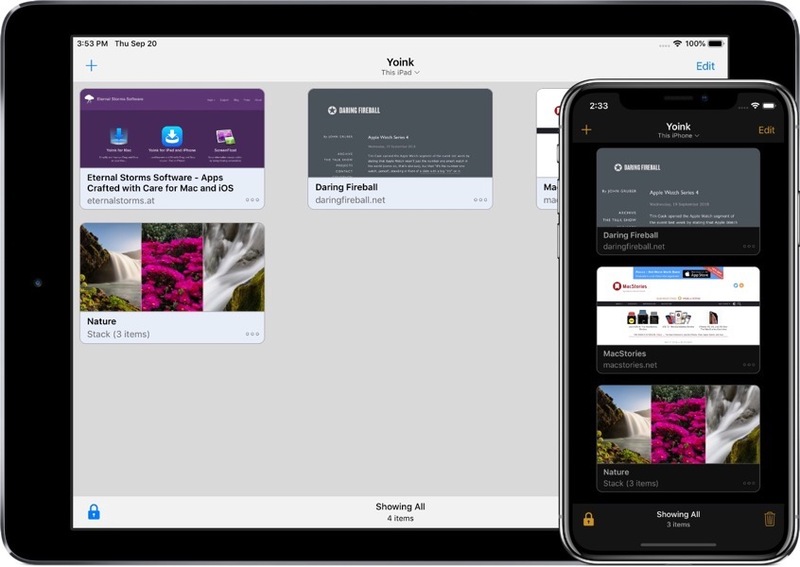 It can grab the contents from your clipboard and it offers a Action / Share extension, so that whenever you use a Share sheet in iOS, you can add that shared item to Yoink – no drag and drop required. The app doesn’t even have to run. How do I get stuff out of Yoink? That’s just as easy. Either use drag and drop, or copy the items, or share them from within the app. Yoink comes with a custom keyboard extension, which lets you use items you’ve stored in Yoink without having to leave the active app you’re currently editing text in – just switch to Yoink’s keyboard and drag out (or copy, if you’re on iPhone) the items to the destination in your text. All items in Yoink are indexed by Spotlight, so you can use the system-wide search to find items. The results are draggable as well. How are items in Yoink represented? 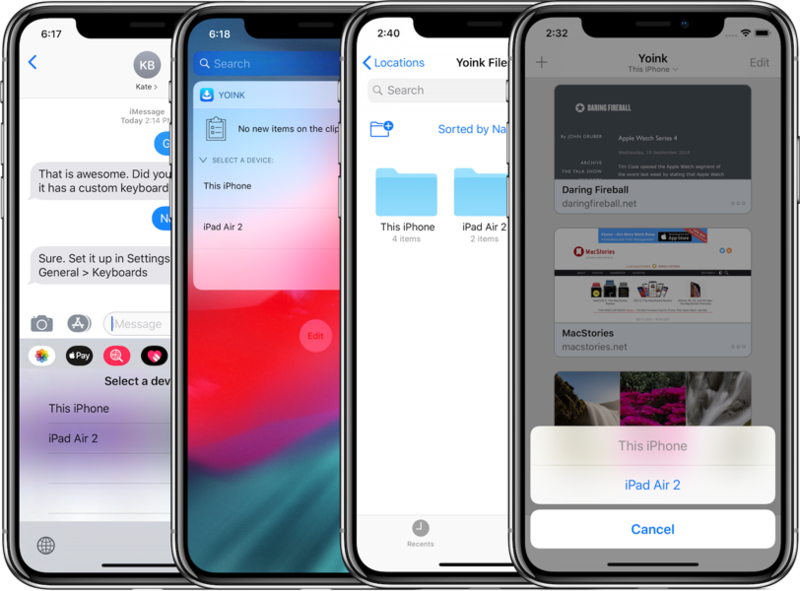 Yoink creates a rich preview for every item you add, so that, at a glance, easy identification is possible (for example, web link items show part of the website, map locations show a preview using Apple Maps). A full look at the item is available by tapping onto the item. Yoink doesn’t delete items right away. Instead, like in Photos.app, items you drag out of Yoink or delete are put into the Trash, where they remain for a specified amount of time, after which they’re really deleted. So should you find you still need an item, you can restore it right away. Yoink for iOS is available on the App Store right now, for the introductory price of $2.99 (€3,49) – it will rise in November. An iPad or iPhone with iOS 11 is required. 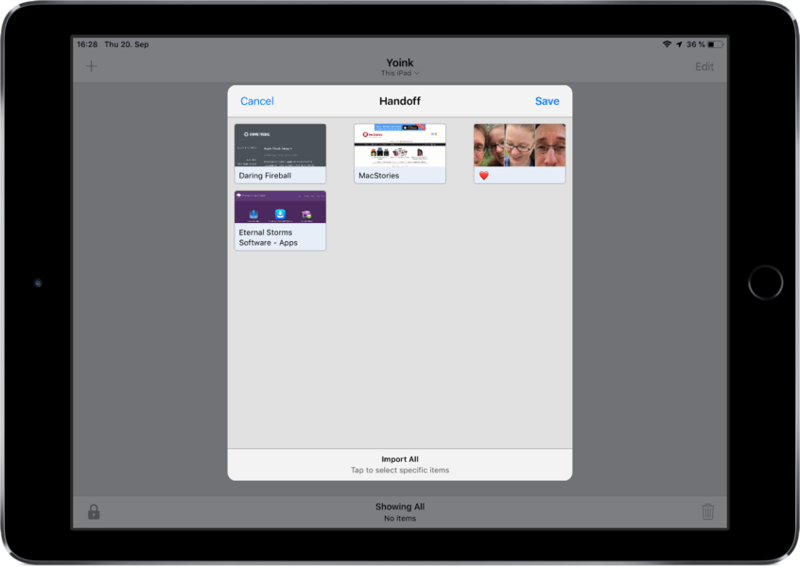 I had planned and was ready for releasing Yoink for iPad together with iOS 11, on September 19th, 2017. As you may know, that didn’t work out. The app was ready, I was set, but App Review wasn’t happy with the app and so I missed the date, while other, let’s say similar apps, were allowed in. After a lot of discussion by mail and phone with the App Review team, and having to remove some things from the app, Yoink was finally approved yesterday. Thank you for your patience, and I hope you enjoy the app 🙂 Please spread the word and if you have the time and like the app, please consider leaving a little review on the App Store – it would mean a lot to me!